Heated Seats, Smart Device Integration, Lane Keeping Assist, iPod/MP3 Input, Back-Up Camera, Hybrid, Dual Zone A/C. MIDNIGHT BLACK METALLIC exterior and BLACK interior, Hybrid LE trim. FUEL EFFICIENT 53 MPG Hwy/51 MPG City! CLICK ME! KEY FEATURES INCLUDE Heated Driver Seat, Back-Up Camera, Hybrid, iPod/MP3 Input, Onboard Communications System, Keyless Start, Dual Zone A/C, Lane Keeping Assist, Smart Device Integration, Heated Seats. MP3 Player, Remote Trunk Release, Keyless Entry, Child Safety Locks, Steering Wheel Controls. Toyota Hybrid LE with MIDNIGHT BLACK METALLIC exterior and BLACK interior features a 4 Cylinder Engine with 208 HP at 5700 RPM*. EXPERTS REPORT On the highway, the Camry is comfortable and compliant. The Camry's big, comfortable seats, smooth ride and powerful climate control mean a pleasant experience for passengers of most sizes. -Edmunds.com. Great Gas Mileage: 53 MPG Hwy. WHY BUY FROM US Toyota Santa Monica is just waiting to assist you in any & all of your Toyota needs. Our vehicle model floor is stocked only with the hottest new Toyotas, all available to you for incredibly affordable prices you'll love. We are proud to possess great options for every individual driver and his or her own unique lifestyle. We've got what you're looking for. Horsepower calculations based on trim engine configuration. Fuel economy calculations based on original manufacturer data for trim engine configuration. Please confirm the accuracy of the included equipment by calling us prior to purchase. Heated Seats, Sunroof, Smart Device Integration, Lane Keeping Assist, Alloy Wheels, SUNROOF PACKAGE, AUDIO PACKAGE, Back-Up Camera. MIDNIGHT BLACK METALLIC exterior and BLACK interior, Hybrid SE trim. EPA 47 MPG Hwy/44 MPG City! SEE MORE! KEY FEATURES INCLUDE Heated Driver Seat, Back-Up Camera, Hybrid, Aluminum Wheels, Keyless Start, Dual Zone A/C, Smart Device Integration, Lane Keeping Assist, Heated Seats Rear Spoiler, Remote Trunk Release, Keyless Entry, Steering Wheel Controls, Child Safety Locks. OPTION PACKAGES SUNROOF PACKAGE power tilt/slide sunroof and moonroof, AUDIO PACKAGE Radio: Entune 3.0 Audio Plus, Qi-compatible wireless smartphone charging, Connected Navigation and App Suite, 8 touch-screen, AM/FM CD player, MP3/WMA playback capability, auxiliary audio jack, USB 2.0 port w/iPod connectivity and control, voice recognition, hands-free phone capability and music streaming via Bluetooth wireless technology, Connected Navigation Scout GPS Link App w/moving maps w/3-year complimentary trial, Siri Eyes Free, Google voice controls, HD Radio, Entune 3.0 App Suite, SiriusXM Satellite Radio w/3-month complimentary SiriusXM All Access trial, Gracenote album cover art, Entune 3.0 Toyota Connected Services, Safety Connect w/3-year complimentary trial, Service Connect w/3-year complimentary trial, Remote Connect w/6-month complimentary trial and Wi-Fi. Toyota Hybrid SE with MIDNIGHT BLACK METALLIC exterior and BLACK interior features a 4 Cylinder Engine with 208 HP at 5700 RPM*. EXPERTS ARE SAYING Great Gas Mileage: 47 MPG Hwy. BUY FROM AN AWARD WINNING DEALER Toyota Santa Monica is just waiting to assist you in any & all of your Toyota needs. Our vehicle model floor is stocked only with the hottest new Toyotas Horsepower calculations based on trim engine configuration. Fuel economy calculations based on original manufacturer data for trim engine configuration. Please confirm the accuracy of the included equipment by calling us prior to purchase. Sunroof, Heated Leather Seats, Navigation, Dual Zone A/C, Cross-Traffic Alert, SUNROOF PACKAGE, NAVIGATION UPGRADE, Hybrid. Hybrid XLE trim, CELESTIAL SILVER METALLIC exterior and BLACK interior. EPA 47 MPG Hwy/44 MPG City! READ MORE! KEY FEATURES INCLUDE Leather Seats, Heated Driver Seat, Back-Up Camera, Hybrid, Aluminum Wheels, Remote Engine Start, Dual Zone A/C, Cross-Traffic Alert, Blind Spot Monitor, Smart Device Integration, Lane Keeping Assist, Heated Seats, Heated Leather Seats Remote Trunk Release, Keyless Entry, Steering Wheel Controls, Child Safety Locks, Electronic Stability Control. OPTION PACKAGES NAVIGATION UPGRADE Radio: Entune 3.0 Audio Plus w/JBL Audio, Qi-compatible wireless smartphone charging, Clari-FI, Connected Navigation and App Suite, 8 touch-screen, AM/FM CD player, MP3/WMA playback capability, 9 speakers in 9 locations, auxiliary audio jack, USB 2.0 port w/iPod connectivity and control, voice recognition, hands-free phone capability and music streaming via Bluetooth wireless technology, Scout GPS Link App w/moving maps w/3-year complimentary trial, Siri Eyes Free, Google voice controls, HD Radio, Entune App Suite, SiriusXM Satellite Radio w/3-month complimentary SiriusXM All Access trial, Gracenote album cover art, Entune 3.0 Toyota Connected Services, Safety Connect w/3-year complimentary trial, Service Connect w/3-year complimentary trial, Remote Connect w/6-month, SUNROOF PACKAGE power tilt/slide sunroof and moonroof, REAR SPOILER. EXPERTS CONCLUDE Edmunds.com's review says On the highway Great Gas Mileage: 47 MPG Hwy. 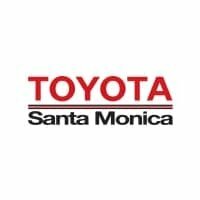 OUR OFFERINGS Toyota Santa Monica is just waiting to assist you in any & all of your Toyota needs. Our vehicle model floor is stocked only with the hottest new Toyotas Horsepower calculations based on trim engine configuration. Fuel economy calculations based on original manufacturer data for trim engine configuration. Please confirm the accuracy of the included equipment by calling us prior to purchase.